This image by Jacob Blackmon is released under the Christina Stiles Presents line of stock art. It reveals a wary Street Alchemist looking to sell her (less than legal?) wares from the shadows of the urban sprawl. 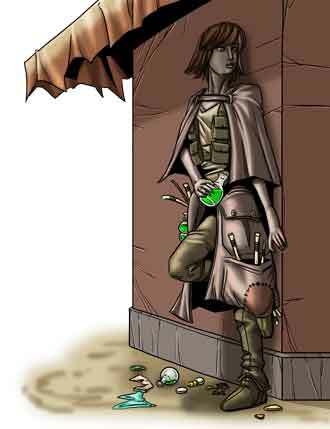 Is she simply being a cautious merchant or does what she is selling give her cause to be on guard?